I wrote about it long ago but i feel it`s time to re-visit this topic. It`s not very often you see people write about ice-molds but here`s a post over at Let`s Tiki. The first time i saw a picture of a tiki drink with an ice mold of some kind was the cocktail chronicles post about the Luau Grog. it had that ice-cone you make in a pilsener glass. That picture was enough to make me dream..Then i saw a few pictures of the Dr Funk`s Son cocktail served in an entire ice-mold around the glass. The rest i saw in Beachbum Berry´s books and i was intrigued. I made my first attempts in 2008 and made the Dr Funk`s Son and experimented with both crushed and plain ice molds around the glass with various results. I made a blog post about the other attempts to make ice molds as well. I found it to be difficult without an ice-shaver since you need fine ice for the molding made easier and with good results. I used a hand-mixer to get the crushed ice become more fine. I had to (and still have to) first crush the ice and since my hand-mixer is broken down i need to beat it with a mortar to become easier to mold. Since i let the ice cubes stay out for a little while to soften it`s necessary to work quickly cuz the melting goes fast. You mold the shape you want and then place it in the freezer for at least 2 hours before using in the drinks. They used to serve tiki drinks with ice molds back in the days…but in our time it`s a rare thing, but i`ve heard they does it in Mai Kai. It would be a very cool experience to order a few drinks served that way. We know that we drink with our eyes too and how a drink is presented whether it has garnish or no garnish is very important and affects the whole drinking experience. And the ice molds has a way of transforming the feel when you have them in your hand, there`s something magic about them. 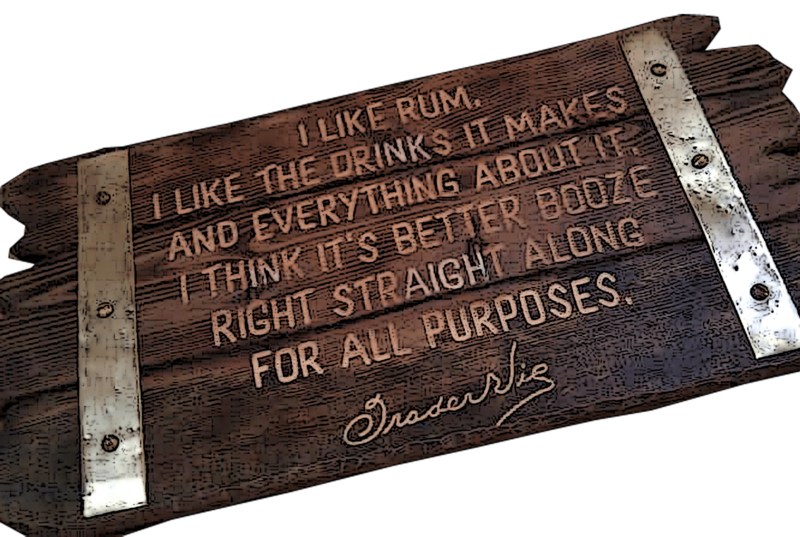 Add to that the fact that a tiki drink in itself has a magic feeling especially if you`re in a dark tiki bar with the right atmosphere. But that`s the whole point of tiki – escapism. I`m gonna present a few drinks and ice molds that you easily can make yourself. If you have an ice shaver you`ll get much better results than i can get with just roughly crushed ice.nThe first drink is basically a raw chocolate Mai Tai served in an ice tower. To make this ice-tower you need a glass and a plastic (or other) container that is larger than the glass, so you can put crushed or shaved ice and fill up with water in between after you place the smaller glass in the larger container. Make sure the glass is no taller than the outer container. My glass did start to float a bit so i did place a stone on it. Then you put it in the freezer for at least 2 hours (or overnight). Then you hold the container under hot water until the ice/glass inside is loosened. Then i did put it back in the freezer for another 30 min so it could freeze back a bit more before using it. 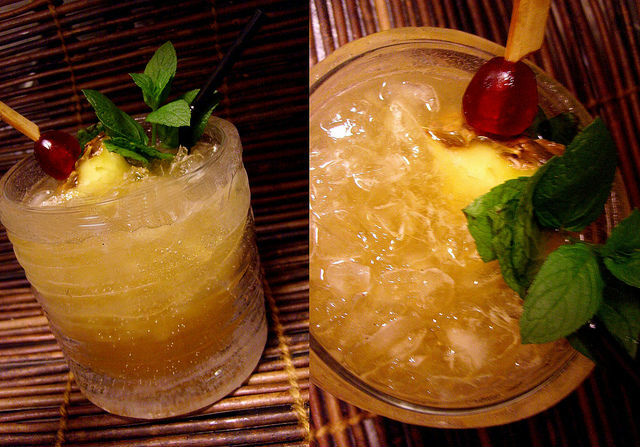 Here`s a basic Mai Tai, Trader Vic`s recipe but one ingredient is added, not much but the change produces a new cocktail – bittersweet, dry and crisp with a hint of vanilla – that`s the the Mozart Dry Chocolate Spirit and only 1/4 oz is added. But that`s enough to change the drink. Since Mozart Dry is quite concentrated and has that crisp dryness you only need a little to create a very nice contrast. To go with the raw chocolate i used chocolate mint for garnish – and really, the leaves does have a decadent fragrance of peppermint and chocolate. (menta x piperita f. citrata “chocolate”) Its truly delicious! make sure the straws are short and placed near the mint. 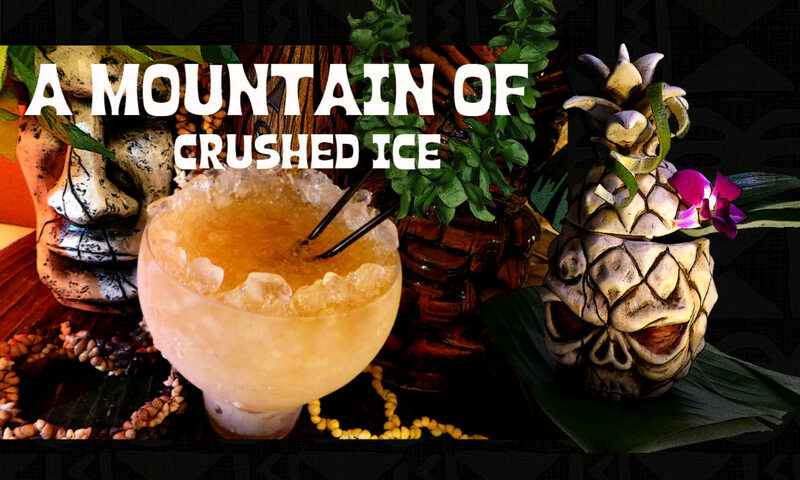 Since it´s a new ingredient added i give the drink a different name even though basically it`s a strong chocolate flavored Mai Tai – served in the same kinda cool ice-tower as Dr Funk`s son. Shake with the spent lime shell in the shaker with crushed ice and pour unstrained into the ice tower, fill up with more crushed ice if needed. Garnish with chocolate mint and speared cherry/pineapple chunk. From above the thin layer of ice on the glass is seen. To make an ice shell you fill the glass with shaved (or crushed) ice and with a spoon press on the ice so it goes upward and forming a shell around the edge of the glass – pretty cool. To get this really nice you need an ice shaver. The ice-shells can be made a bit differently, some to look like a hood half over the glass, like an ice cave. While others are a thin wall of ice sticking up irregularly around the edge of the glass. An ice-shell made with crushed ice instead of finely shaved may look a bit clumsy but it still works, it manages to add that mystic feeling of old tiki times gone by…and as for chilling the glass the ice-molds does that very well. I have chosen a drink from Jeff`s latest book the Remixed that i like a lot to be served with the ice-shell. Place pineapple, lime, chartreuse and cacao in a shaker and muddle. Add rum and ice cubes and shake well and strain into a chilled cocktail glass but in this case a glass with an ice shell. The Pago Pago Cocktail dates back to 1940. 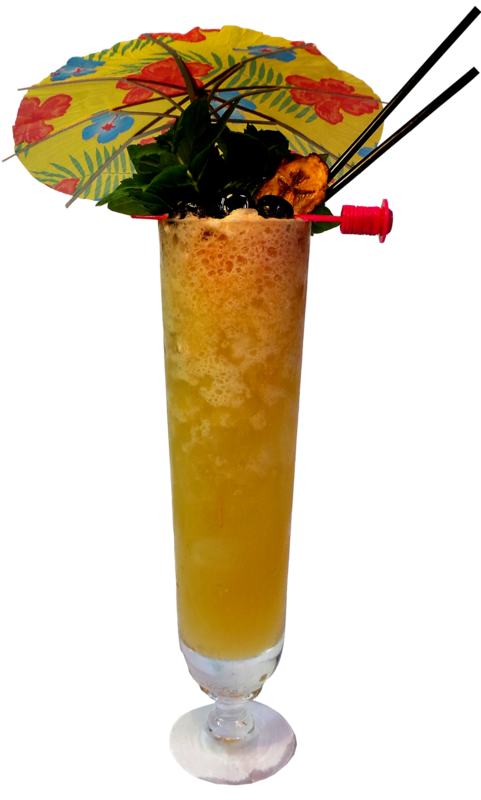 Then we have the ice-cone as seen being served with the Captain´s Grog, Navy Grog and the Luau Grog. Its easy to make, just pack a pilsener glass full with shaved or crushed ice and place a straw in the middle, then freeze for at least 2 hours or even better, overnight. When you take it out, pour warm water over the glass so the cone comes out. In your shaker, muddle the pineapple chunk and guava jelly in lime juice. Add rum, grenadine and demerara syrup. Shake and strain into a punch goblet (or rocks glass) filled with a large ice cube – here replaced with the ice-cone. Garnish with a lime wedge, pineapple chunk and mint sprig. This drink was really nice with an aged rhum agricole. I used Clemènt VSOP and then i also added a small float of Pusser´s overproof…i like to kick up my drinks a little bit. Finally, all i can say about using ice molds is that yes, it does take some time and effort to do them so i won´t do them very often..but when i do..oh my, it really is a special feeling to drink with an ice mold in the glass – but bear in mind that these molds here are really not very good because without finely shaved ice you cannot get that look the old ice molds have. For some reason shave ice devices are not sold here where I live so it´s a bit difficult. And one more thing, when you work with the ice it`s easier with ice that has softened a bit and that requires that you work not too slow. When the molds are ready it`s good to let them freeze overnight. I did freeze mine for 2 hours but that was mainly because i wanted to et going with the photographing of the drinks. The molds doesn`t melt as fast as you may think, they keep quite good – at least long enough to imbibe the drink, especially if the molds are left to freeze overnight. I have a feeling of slipping in on a banana peel here, i forgot it was monday yesterday..
There`s along tradition of punches and it would have been interesting to go more into it but i feel i don´t have time now as i need to whip up a cocktail pronto so i`ll keep it simple and mix up another type of punch that belongs to warm tropical days and nights. I´ll go for lime and i`ll make a punch inspired by the Ti Punch – but not a traditional Ti Punch. The traditional Ti Punch is a simple as its delicate and so well suited for the tropical climate in where it was born. Its rhum agricole, lime and sugar or cane syrup, maybe an ice cube or two, stirred in a rocks glass. I`m using rhum agricole too – both aged and white, together with fresh lime juice and palmsugar and raw sugar, Trader Tiki`s exquisite vanilla syrup and then topped with a little Ting ( my faithful companion). Add ingredients in mixing glass and stir together well with ice, then strain into a punch glass and top with Ting. Garnish with lime and mint. You may adjust the levels of syrup and sugar to your own taste, this drink is forgiving. This is a drink that talks about summer, well – its not summer yet but i pretend all year that it´s summer.